Plug in the IP with insert set in place. Press SAUTE on the IP and heat 1 tablespoon of oil. Add the spinach in four batches to the IP and cook down until all the spinach is wilted and decreased in volume by half. Transfer the spinach to a colander and press through any excess liquid. Place spinach onto a cutting board and coarsely chop. Return the chopped spinach to the colander and press through any excess liquid again; set aside. Pat the pork chops dry with paper towels and season with salt, pepper and garlic powder. In the now empty IP, heat 1-2 tablespoons oil; sauté the seasoned pork chops in batches and brown on each side. Add onions and garlic and sauté until onions have softened. Then add chicken broth to the IP. Secure the lid of the IP and ensure the valve is set to SEALING. Press MANUAL and adjust the time to 10 minutes on HIGH pressure. The display will reflect ON while the IP comes to pressure. Allow a few minutes for your IP to come to pressure. Once at pressure, the display will reflect 10 (the number of minutes you initially set) and will begin to countdown to 0 minutes. Open up your IP when the pin has dropped (allow a few minutes for this to happen). The IP will automatically default to the WARM setting. Using tongs, transfer chops to a platter, tent loosely with foil, and let rest 10 minutes (internal temperature will climb to 165 degrees). Press SAUTE and allow liquid to reduce by half. Whisk in flour and garlic powder. Slowly add heavy cream, stirring constantly. Add salt, pepper and nutmeg and simmer until sauce thickens up. Remove from heat and stir in 1 cup Parmesan and reserved spinach to create the sauce. To serve: plate the pork and top with the Parmesan spinach sauce. This was amazing! And the best part is my 12yr that despises all veggies and everything green loved it. 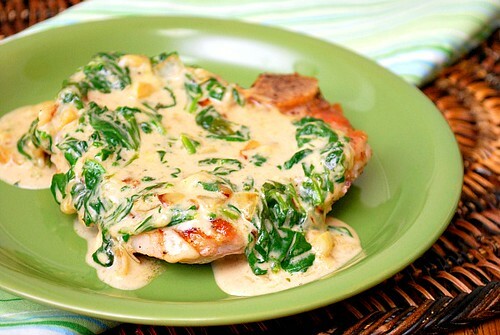 The sauce was so loaded with spinach she couldn't pick it out but admitted she liked it, even the spinach. All my kids can't wait for me to make this again! I just finished making this!!!! It is so tasty. I love it. Thank You for sharing. To avoid a burn message on my IP, I'm used to needing to deglaze the pot after browning meat. Do you not need to with this recipe? 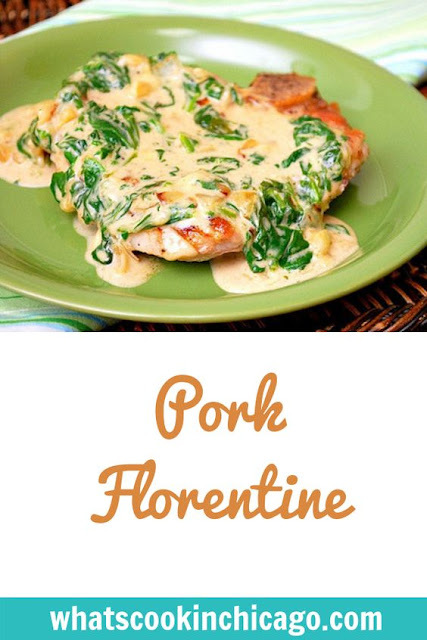 Made this tonight with pork cube steak and frozen spinach, we all loved it. This looks amazing!! I'm going to try it with chicken breasts instead of pork.